CHANDLER, Ariz. — Rewash is a dirty word in the laundry industry. And equipment malfunctioning at any step can lead to the need for rewash. With flatwork ironers, rewash can come in the form of stains, rips, or product with holes in it that went through the ironer or happened on the ironer. It shows up on the ironer because that’s the last thing that happens to the product before it goes to packaging or goes out the door to the customer. “One thing for sure, we know that rewash costs a lot of money,” says David Rovetto, a regional sales manager with Tingue. Rovetto shared 10 practical keys to focus on when it comes to ironer care and performance during an Association for Linen Management (ALM) educational session here called Squash the Rewash. Rovetto says that it doesn’t matter who the ironer manufacturer is, or the size of the machine, the chest underneath all of the padded rolls needs to be cleaned, and it should be lubricated. There’s nothing more important than cleaning and lubricating your ironer chest at the beginning of each shift, according to Rovetto. Something that he encourages laundries to do is run a scouring pad at the beginning of the day. It doesn’t matter which kind of scouring pad, or what shape or size. The bottom line, he says, is to use something that will clean the ironer chest. Rovetto recommends scouring and waxing the chest at the start of the day and at lunch break. Run the scouring pad, run the wax cloth, restart the vacuum and the machine is good to go, he says. He recommends that healthcare laundries scrub and wax a couple times a day. If a plant processes food and beverage linens, it should happen every couple of hours. In food and beverage, it tends to be more sensitive to lubrication. There are all kinds of wax cloths, according to Rovetto, even wax cloths that used to be sheets. However, he says that’s not an ideal method because with the sheet, as soon as the wax melts, it’s going in both directions. How much wax should be used? Rovetto recommends just one 8-ounce cup of wax. His advice is to wax sparingly, but often. He says to only add wax when the pocket is cold and limp. If powder wax is used, if the pocket is stiff, wax does not need to be added. If a laundry has multiple ironers, Rovetto recommends alternating the ironer that is waxed first. He says that, for example, if a plant has three ironers and employees always start waxing on ironer one, ironer three might “get the short end of the stick” when it comes to wax coverage. “A lot of people I talk to say they can wax it in the morning, but they can’t get it at the morning and lunch break. But, they still have time to go behind the folder when called because of ironer number two to pull the jam out of the folder,” he says. “The linen probably wouldn’t do that if it wasn’t processed well because of the dirty chest or static. Rovetto says it’s important to run the ironer with proper chest temperature so that the wax works effectively. For example, steam-fueled ironers, which have probably a half-dozen waxes, powder and paste, under 350 F, they do a great job, he says. There would be no need to have a high-temperature wax for a steam ironer. He says that between 300 and 350 F is a great temperature for a steam ironer. If the temperature is below that, there will be linen travel issues, and the equipment may have trouble drying the linen. “And whoever your pad or ironer person is, certainly get them involved when that happens,” he recommends. Linen quality will be affected if the pH of the water gets too high or low, Rovetto says. “We work with the chemical folks sometimes to diagnose a linen quality issue that the customer is having, when they’re having a lot of headaches and can’t get good product to the ironer and don’t get a good finish at the end,” he says. The pH level is something Rovetto says that his staff checks. They use a small pH test kit, and the moment a client is having trouble with linen travel, they check that, along with other issues. “It does show up on the ironer. Whether or not it’s the proper weight, or whether or not it got washed with the correct formula, will show up on the ironer when it comes to that heat and the moisture in the product,” he says. Whether it’s processing sheets, tablecloths, napkins, pillowcases, etc., Rovetto says that ironers are a lot like when he would leave his clothes in the dryer too long and they would have a rough, dry look. “Taking an iron to it at that point wasn’t going to do anything,” he says. In order to give the product a good finish, Rovetto says about 30% moisture is needed in the linen. He says that product can be too wet, but it’s probably better to be a little high on moisture than to be too low because it will look like the ironer didn’t press it out. Rovetto had a customer where all of the ironers were running well but then ran a different color through the equipment. The client didn’t have the right moisture in the product when it went through the ironer, and all of it looked bad. Then they went back to white, and the ironer put out a quality product. The ironer will only put out what it is presented, Rovetto says, so load it properly. It’s important to feed the product into the ironer square along the lead edge. Sometimes, according to Rovetto, a laundry may see that the product is fed properly but it’s off because something else starts slipping. The ironer will press it, but it won’t look as good. Rovetto says that most of his customers struggle with the ironer’s vacuum system. Whether it’s a new or old ironer, if it has springs on it, more than likely there is a vacuum system. The vacuum system pulls moisture out, he says. By pulling the moisture out, the roll stays hot, promoting better drying and helping to maximize speed. Rovetto also says a vacuum system prolongs pad life because wet pads—it doesn’t matter what they’re made of—are not going to last as long. Rovetto recommends cleaning the ducts annually. They should be taken off during downtime in order to make sure they’re not clogged. They’re going to rust over time, but clogging the ducts helps to speed that process up. The springs should last 15 years on equipment used during 40-hour workweeks, according to Rovetto. “With a 40-hour workweek, you should not have to replace the springs twice on the same piece of equipment.” he says. Chest-to-roll contact, this is something that Rovetto says is often an interesting subject with a customer. The laundry is trying to get the most life out of its product. The ironer, in terms of maintenance, is saying it’s time to re-pad it, but the pads look good. 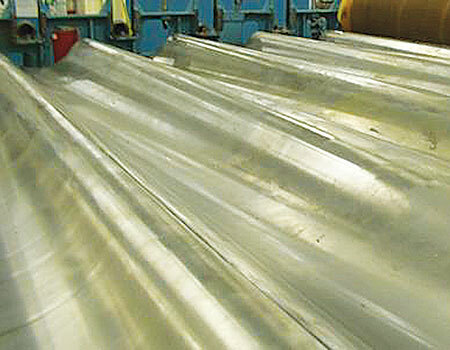 The typical thing Rovetto sees is that the ironer tape is pulling the product along instead of the roller pushing along the ironer tape. Because the product is dragging, he says, little “crow’s feet” form on each side of the ironer tape. That means it’s time to pad the ironer. Depending on the type of ironer used, some ironers will have a pad cover that goes on each row. The larger ironers just have a pad that serves as both. If a laundry goes back to using the pressure level from the day before the re-padding, linens could get scorched. There are different speed issues that should be addressed on different pieces of equipment, Rovetto says. With a feeder, an ironer and a folder, there should only be a 2-3% speed graduation from each piece of equipment. Why? The purpose is to continue to keep the linen flat, pulling by the faster roll. The ironer should be turning faster than the feeder, and the folder turning faster than the ironer. That’s the way it should happen. “You’ll know it when you see it because you’ll see, for example, your sheet won’t stay flat. It will be coming up,” he says. “It’s something that needs attention quickly because all of your ironer tapes will be coming off the chest. He says that if a laundry has a 4- to 5-foot gap between pieces, turning up the speed isn’t going to get more pieces through. If a machine is running faster than someone can feed, the numbers won’t be there. A laundry can still get the numbers it wants, with better quality and fewer rejects, if the ironer is slowed. Drive rolls that turn the feed belts need to be covered, Rovetto says. Rovetto suggests having a troubleshooting procedure to check when quality drops on an ironer. Rovetto says that there is normally more than one cause for decreasing ironer quality. It’s a matter of spending some time watching the product go through the plant, he says, while taking measurements.